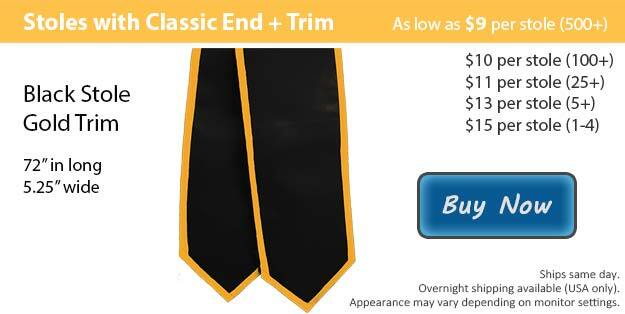 Our stoles in black with gold trim will be an outstanding way to represent yourself this graduation. Your graduation is coming up fast and thanks to your dedication along with all of your hard work, you have finally reached your goal. As you prepare to take the next big step into an entirely new chapter of your life, Honors Graduation is here to you help you look your very best. Graduation is a monumental part of your journey, it is a celebration honoring you for all that you have accomplished over the past few years. We have all the gear that you will absolutely be needing to walk with your class during your big day, including all of the accessories and keepsakes you might be looking for to bring your whole outfit together perfectly. Typically graduating students are required to dress in a cap and gown at the time of their graduation ceremony. It is not uncommon for students who are graduating to accessorize with graduation tassels and stoles as well. Graduation stoles can be a great way for you to signify a specific group or club that you had the opportunity to be apart of. Here at Honors Graduation we have graduation stoles available in a large variety of colors, they can either be plain or you can select the contrasting color of your choice for the trim. If you wish to add a design of your own to your stole, we can help you with that as well! We offer stole customization by embroidering the design you request for a small additional fee. After graduation is over, your custom stole makes for a spectacular momento, hang it up in your home or office to always be reminded of how far you have come and all you have accomplished.